We are excited to share the progress of our blossoming wildflower research and citizen science project following an incredible field season in Grand Teton National Park. And I am so grateful for your commitment to conservation through staying engaged with us. Following in the profound footsteps of the legendary ecologist Dr. Frank Craighead Jr., my research adventures lead me back to the wildflowers and wildlife of the Greater Yellowstone Ecosystem (GYE). Led by Dr. Corinna Riginos and myself with the Nature Conservancy and the Northern Rockies Conservation Cooperative, we have partnered with BrushBuck Wildlife Guide Services, the United States Geologic Survey (USGS),the National Park Service (NPS) and the community of Jackson Hole, to initiate and maintain a long term CLIMATE CHANGE study and CITIZEN SCIENCE program in the heart of Grand Teton National Park. Beginning in the 1960’s and 70’s, Frank Craighead and his twin brother John pioneered biological research in Yellowstone and the Tetons – inventing telemetry, the method of radio tracking animals pioneered on Grizzly Bears, coauthoring the National Wild and Scenic Rivers Act, and introducing the widely adopted concept of the Greater Yellowstone Ecosystem (which contains two National Parks, 5 National Forests and 5 National Wildlife Refuges making it the world’s largest intact ecosystem in the Temperate Zone at 22 million acres of public and private land). Further Frank and John were expert survivalists, anglers, botanists, falconers, and film makers starring in several National TV Specials. The last book Frank Craighead published before his passing is an amazing field guide and photographic narrative titled For Everything There Is Season: The Sequence of Natural Events in the Grand Teton-Yellowstone Area. This book is a wildly detailed week-by-week account of the timing of ecological events (phenology) in the Teton region, based on over four decades of observations on phenomena such as the date of first flower emergence for Silvery Lupine, to the berries preferred by bears in late summer, and the great migration patterns of ungulates such as the Rocky Mountain Elk, Pronghorn, and Mule Deer. All these events are driven by plant phenology- when and where plants green up, flower, and fruit providing critical food and nectar for countless mammals, birds, and insect pollinators. Now nearly 50 years in the future since Frank Craighead began his data collection, we have initiated contemporary observations in the Tetons, retracing his exact footsteps from outside his old cabin through the sagebrush and glacial cobbles rising through aspen forests, then mixed conifer woodlands, into the wildflower meadows near the summit of Blacktail Butte. This magnificent limestone escarpment littered in ancient ocean fossils, now rises high above sea level (7,688 feet (2,343 m)), yet remains an island in a sea of sagebrush flats, the Jackson Hole valley, surrounded on all sides by the Beartooth Absoraka mountains to the north, the Gros Ventres to the east, the Snake River Range to the south, and the infamous Tetons to the West. Blacktail Butte is the best of all worlds for many species, providing critical habitat for elk, moose, grizzly bears, black bears, wolves, hawks, mule deer, and many other species varying throughout the year, as well as one of the best easily-accessible hiking trails and sport climbing destinations in the region. This location is perfect as both a laboratory for ecological research, as well as classroom for community engagement of all ages. This year, 2017, was a landmark year for our work, launching rigorous scientific data collection on 75 species of plants, visiting Blacktail Butte over 60 times from first snowmelt on the valley floor in mid March to when the final golden leaves of the aspen fell near the end of October. Preliminary findings suggest we are observing many wildflower species blooming days to several weeks earlier than anything Craighead ever saw. This raises the question of how will plants and animals respond to even greater temperature increases, earlier snow melt timing, and altered precipitation patterns in the future under increased climate change? How can we prepare our conservation management efforts to preserve imperiled species, and ensure wildlife persists in the region under increased pressure? Climatic events occur on a longer timescale than just one year, thus these questions can only be fully explored by monitoring Blacktail Butte for several more years (ideally 5 or more), to create a modern data set that can be adequately compared to the decades of work by Frank Craighead. This year we also initiated our Wildflower Watch citizen program providing opportunities for 55 volunteers aged 9-90, empowering them to record phenology data on 10 common species of Blacktail Butte. After a single training session, many of our volunteers returned throughout the summer and fall on their own to make additional observations, mailing us their filled out spreadsheets to add to our growing data set. I am so proud of our citizen science team, and can’t wait to get out into the field with them again next spring. We also engaged hundreds of people at several major community events. I was honored to give the keynote presentation on our work at the Jackson Hole Conservation Alliance annual meeting, represent NRCC at Old Bills Fun Run, lead a citizen science hike for the Sierra Club, and give a public presentation for Nature Night at the Teton County Library hosted by Teton Plants. I hope to engage as many people as possible over the coming years and foster a community of citizen scientists and climate stewards in Jackson Hole. Thank you to every each and everyone of you who has helped make this amazing project a reality through encouragement, donations, and volunteered time. You are making a difference in the conservation of the Rocky Mountain region, and allowing Jackson Hole to serve as an inspiration in sustainable practices and climate action for the world to see. Please feel free to contact me at anytime for more information. I’ll keep you posted on any upcoming events, and hope to see you out in the field next Spring. Leading a citizen science training session at Blacktail Butte, July 2017. Photo © Julia Huggins. The Climb It Change mission…. continues: Explore and conserve the mountains, protect wildlife, better understand and prepare for impending impacts of climate change, be proactive, and most importantly get as many other people outside and engaged with nature to foster respect and stewardship of wild places! This is so amazing! I am so proud of you! I loved your interview. Developing a cadre of “citizen scientists” is inspired. 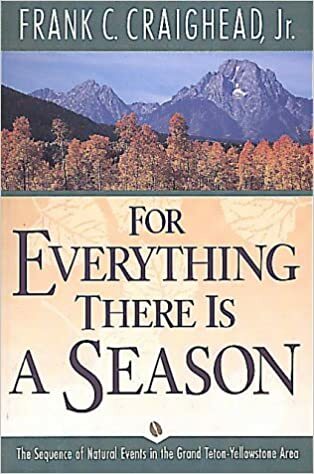 Your study following up on the Dr. Craighead’s book For Everything There is a season is very valuable as a measure for climate change. PS The photos are beautiful!